PrestaShop Barcamp 5 in NYC: a Great Day with Great People in a Great City! 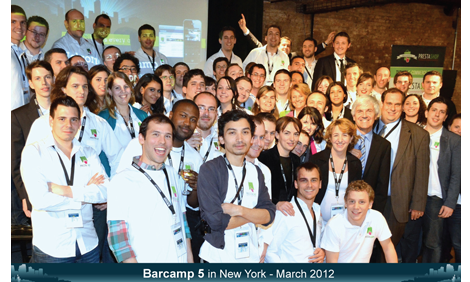 More than 320 participants were present for our 5th Barcamp in New York City! Thank you everyone who came out for this exceptional event! The day was filled with lectures, workshops led by our team, and valuable tips from our partners. It was definitely a successful first Barcamp in the United States, and we can't wait to see you again soon. The energy at 82Mercer was truly hard to describe, so we've put up photos of the event on our Facebook page, check them out! Head to our website to see some of the PowerPoint presentations by our key speakers and get their best advice and techniques! "The world is changing quickly and you need Open-Source to stay on top"
"A great event, and a great product. PrestaShop is definitely the one to watch in the Open-source e-commerce space"
"The Barcamp 5 was not just a great way to experience the vibrant PrestaShop community, but was also informative and fun; I will certainly be going to the next Barcamp!" "We had a great time at the Barcamp. You guys did a GREAT job on everything!" "It was great to get together with the PrestaShop experts. We have received a lot of valuable feedback from PrestaShop users and we are definitely looking forward to the next Barcamp! "We had an incredible Barcamp with our American community. Thank you for this amazing day, it was great to meet you all!" 4 key pieces of advice for combining your online business and your physical businesses!